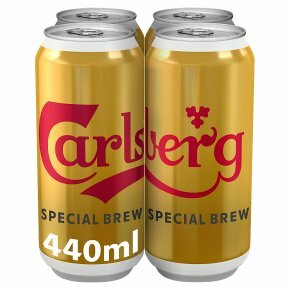 Carlsberg Special Brew is a deep blonde imperial strong lager with a sweet bitter nutty, caramel cognac-like flavour and a warming rich lingering finish. For best results pour Carlsberg Special Brew into a straight or stemmed glass at a temperature of 6°C to 8°C. Carlsberg Special Brew pairs wel with mature & blue cheese. Best served shared. Danish strong lager brewed in the UK using a Danish recipe and yeast. Specially brewed in 1950 to mark a visit to our brewery by Sir Winston Churchill, this full-bodied strong lager has a rich malty flavour and a subtle hint of cognac - a nod to the great leader's favourite after-dinner digestif. The Pursuit of Better Pioneers of Purity At Carlsberg we believe in sharing life's good things. So in 1883, when we discovered the secret of purifying yeast for making consistently great beer, our founder shared it freely with the world. Skål! A Scale of Betterment In 1909, as part of our pursuit of brewing better beer, we happened to invent the pH scale - now a global scientific standard. Skål!